I was at Morgan Stanley back in 2007 when the markets crashed. The first warning for me was when an email came round warning of problems in the money markets. The email didn’t make much sense to me, it wasn’t an area I worked in, but something about the tone made it clear whatever was going on wasn’t good. Of course I had no idea quite how bad it was going to get, few people did. That wasn’t the first recession I’ve seen, and I doubt it’ll be the last. It was though the first I’ve personally seen where it looked like systemic contagion could bring down the entire global finance industry, with catastrophic effects (and not just for people like me, who work in it). Legislators took action with an urgency they’ve never shown in the face of humanitarian crises, banks were bailed out and capitalism was saved to profit another day. I kept my job, plenty didn’t. Afterwards there was a sense in the media that things had to change. Global capitalism had come very close to coming right off the rails, to a major disaster that would have had devastating consequences. As it was we suffered a major depression, jobs were lost, wages stagnated, even now recovery is patchy and the benefits of it unevenly distributed. Politicians made speeches about needing to make sure it didn’t happen again, then implemented policies designed to get the housing markets buoyant again and to encourage consumer spending (which in the absence of wage growth means encouraging consumer debt). It turns out nobody with any kind of major public platform had any alternative to offer. 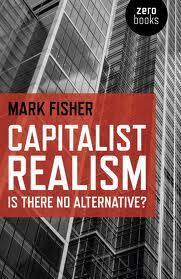 Mark Fisher’s Capitalist Realism is an examination of the prevailing ideology of our times, the neoliberal consensus that is so frequently taken as simple common-sense, even at times in the face of considerable evidence against its core tenets. In the UK all three main parties are essentially neo-liberal in outlook, differing on points of detail but sharing a broad and fundamental consensus that there is no alternative to our current system. Politics in this sense becomes a choice not of how we wish to organise ourselves as a society, but of different management teams. At the same time, public protest is increasingly criminalised – either directly or by how protestors are treated by police while exercising their nominal rights. The result is an ever-increasing disengagement of the public from politics. Fisher opens by considering Alfonso Cuarón’s 2006 film, Children of Men. In the movie humanity has become sterile and is drifting slowly to extinction. In the UK, where the film is set, the country’s art treasures are being gathered and preserved, pointlessly given there will be no future generations to enjoy them. Humanity here is facing an existential crisis, but everyone is carrying on as best they can as if it weren’t happening. Watching Children of Men, we are inevitably reminded of the phrase attributed to Fredric Jameson and Slavoj Žižek, that it is easier to imagine the end of the world than it is to imagine the end of capitalism. That slogan captures precisely what I mean by ‘capitalist realism’: the widespread sense that not only is capitalism the only viable political and economic system, but also that it is now impossible even to imagine a coherent alternative to it. Fisher argues that capitalist realism is in fact a better term for this phenomenon than postmodernism. Capitalist realism’s fundamental tenet that there is no alternative means, if you accept it, that content, lifestyle and product consumption is the only cultural and political game in town, postmodernism accepted almost by definition that other approaches might also be valid. Postmodernism also of course existed in contrast to and in interrogation of modernism, but capitalist realism is self-contained and modernism now a “frozen aesthetic style, never … an ideal for living”. He also notes that we have had a demographic shift, someone born in 1989 at the fall of communism would now be 25 years old – an entire generation has grown up under an essentially unchallenged political ideology. Corporate anti-capitalism wouldn’t matter if it could be differentiated from an authentic anti-capitalist movement. Yet, even before its momentum was stalled by the September 11 th attacks on the World Trade Center, the so called anti-capitalist movement seemed also to have conceded too much to capitalist realism. Since it was unable to posit a coherent alternative political-economic model to capitalism, the suspicion was that the actual aim was not to replace capitalism but to mitigate its worst excesses; and, since the form of its activities tended to be the staging of protests rather than political organization, there was a sense that the anti-capitalism movement consisted of making a series of hysterical demands which it didn’t expect to be met. Protests have formed a kind of carnivalesque background noise to capitalist realism, and the anti-capitalist protests share rather too much with hyper-corporate events like 2005’s Live 8, with their exorbitant demands that politicians legislate away poverty. The green movement does offer a more genuine alternative, but one that few are actually willing to live with. For committed greens capitalism is inherently destructive (“The significance of Green critiques is that they suggest that, far from being the only viable political-economic system, capitalism is in fact primed to destroy the entire human environment. The relationship between capitalism and eco-disaster is neither coincidental nor accidental: capital’s ‘need of a constantly expanding market’, its ‘growth fetish’, mean that capitalism is by its very nature opposed to any notion of sustainability.”) The difficulty is that it’s pretty hard to imagine what a sustainable society would actually look like, and the sacrifices it would require are far more than most people would be willing to make (say goodbye for starters to cheap flights, mass-imported food and consumer gadgets). Generally I found Fisher’s analysis in this part of the book highly persuasive, and certainly well reasoned. I was however less persuaded when the book proceeded to an analysis of how capitalist realism might be a causative factor in the widespread mental illness found in capitalist societies. Fisher says that “The ‘mental health plague’ in capitalist societies would suggest that, instead of being the only social system that works, capitalism is inherently dysfunctional, and that the cost of it appearing to work is very high.” This however assumes causation, where there may only be correlation. It also raises questions of how we recognise mental illness, as with crime statistics a growth in reported crime may mean there’s more crime but it could also mean people are more willing to report it. Arguably an explosion in mental illness could be not an increase in those actually ill, but a greater willingness to recognise and help them. It is not that smoking is ‘wrong’, it is that it will lead to our failing to lead long and enjoyable lives. But there are limits to this emphasis on good health: mental health and intellectual development barely feature at all, for instance. What we see instead is a reductive, hedonic model of health which is all about ‘feeling and looking good’. To tell people how to lose weight, or how to decorate their house, is acceptable; but to call for any kind of cultural improvement is to be oppressive and elitist. In a seeming irony, the media class’s refusal to be paternalistic has not produced a bottom-up culture of breathtaking diversity, but one that is increasingly infantilized. By contrast, it is paternalistic cultures that treat audiences as adults, assuming that they can cope with cultural products that are complex and intellectually demanding. The reason that focus groups and capitalist feedback systems fail, even when they generate commodities that are immensely popular, is that people do not know what they want. This is not only because people’s desire is already present but concealed from them (although this is often the case). Rather, the most powerful forms of desire are precisely cravings for the strange, the unexpected, the weird. These can only be supplied by artists and media professionals who are prepared to give people something different from that which already satisfies them; by those, that is to say, prepared to take a certain kind of risk. Of course following that logic too far risks falling into a classic left-wing trap of assuming that a particular elite group knows what the mass of people want better than those people do themselves. The results of that thinking historically haven’t always been all that might be hoped (though I’d argue it’s Apple’s business model). There’s an element of paradox here. Just cater to what people want and all they get is what they already have, leading to cultural sterility. Tell people what they want though and you risk denying them the freedom of their own choices. In a healthy system the forces of paternalism and individualism would hopefully conflict and bring about some form of dynamic synthesis which, while never perfect, nonetheless broadly worked. I’d query if that’s the system we have. Ultimately the point of a review isn’t whether I agree with Fisher or not (I largely do save possibly on the mental illness arguments), it’s to present what I think is the essence of the book so someone else can take a view on whether or not to read it (I see myself as a reviewer rather than a critic). On that front I’d say that Capitalist Realism is thought provoking, punchy, well argued and short – if the themes appeal it’s pretty much essential reading. That doesn’t however mean it’s always easy reading, you can’t have a book of Marxist analysis and not have the odd sentence like – “Jameson, of course, would argue that the ‘incredulity towards metanarratives’ is one expression of the ‘cultural logic of late capitalism’, a consequence of the switch into the post-Fordist mode of capital accumulation.” – although to be fair I understand that sentence perfectly well and I don’t have a better way to make the point it’s making. Fisher doesn’t offer much by way of solutions to all this. but I’d argue that it’s useful and valid to point out that someone’s house is on fire, even if you have no idea at all how to put it out. Fisher is pointing out that our house is on fire. We have a system which is inherently unsustainable, which by its own logic must constantly expand but which exists in the context of finite resources. I don’t know what the answer to that is, or even that there is one, but if there is any kind of solution the first step to it must surely be understanding the nature of the problem. We have met the enemy and he is us.